One of the true stars of the contemporary art world is a Chicago artist who lives and works in Bronzeville. In November, a painting by Kerry James Marshall sold at auction for more than $5 million. That painting, which was on display last year at the MCA Chicago, imagines the abolitionist Harriet Tubman on her wedding day. 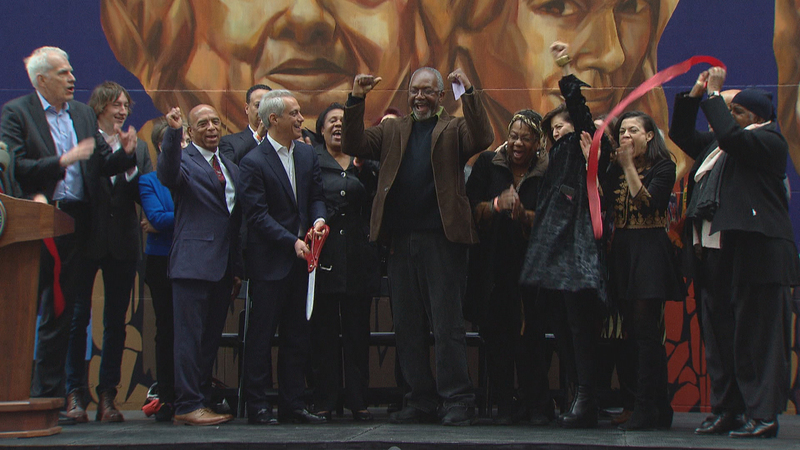 On Monday at the Chicago Cultural Center, Marshall unveiled his largest work to date. For this epic new mural, the artist charged the city $1. “Chicago Tonight” was on site throughout its creation. Kerry James Marshall: When I first saw the building, I knew this is going to be a challenge. This might be a problem. Phil Ponce: It measures 100 by 132 feet on the west wall of the Cultural Center. It honors 20 women, past and present, who contributed to the cultural life of the city. And, this being officially declared the Year of Public Art in Chicago, it is attracting a lot of attention. Mayor Rahm Emanuel: This piece is going to capture, I think, the imagination not only of the city but the country and put Chicago in its rightful place as a city of public art. We are blessed to have one of the great artists of the beginning part of the 21st century, Kerry James Marshall, who will tell the story of 20 women who changed the cultural landscape and changed our vision of the way we see ourselves and the world sees us. Ponce: Work began in September and took nine weeks to complete. Days before its unveiling, a team of assistants helped to complete the mural. Jeff Zimmerman, muralist: We’ve been working 14 hour days really, it’s so big. When you do something this big you’ve got to build in some time for unforeseen events. But it makes it bigger in every sense of the word: more materials, more time. Big means big. Kerry presented me with his design back in the summertime, and it’s just been a question of me blowing up and translating that painting to the scale that it’s at right now. Marshall: It’s an interesting place to try to put a mural, in part because the street is so narrow and the building is so high. You can’t really get a good vantage point where you can see the whole thing from the ground. I mean, as far back as you can get is the building across the street. So it’s a challenge to do a work in a space like this. Ponce: Marshall has a history with the building, dating back to 1990. Mark Kelly, Commissioner of Department of Cultural Affairs and Special Events: His first one-man show was right here in the Chicago Cultural Center, so for him it’s full circle because now he returns with this 100-foot-tall masterpiece. Ponce: It’s painted on limestone, and the city has taken steps to make sure the mural is built to last. Kelly: It’s sealed to protect it from the pollution, from the minimal light rays that come into Garland Court, and so I hope you’ll come back in 40 years and this work will still be as bright and as vital as it is today. Ponce: Even though the artist only billed the city $1, funds were needed to execute the massive mural. Fundraising reached from Hollywood actors to internet entrepreneurs. Kevin McCarthy, Murals of Acceptance: I talked to some people including Patricia Arquette who is a very, very dear family friend of mine and she actually talked to (Marc and Lynne Benioff) and they got together, and, along with their foundations, they were able to kick me down the money that I needed to make this happen. I asked Kerry if he would do it and he said yes, and I said it has to just be something that promotes acceptance and equality of all people, and that’s the whole basis of the company, y’know, so: fine art, public spaces, huge as possible and make people feel good and accepted and happy. WTTW cameraman Dave Moyer films the progress of Kerry James Marshall’s largest work to date. We spoke with another of the subjects about the honor. Barbara Gaines, Chicago Shakespeare Theater: It’s unbelievably flattering. I’ve loved Kerry James Marshall’s work for probably over 25 years and to think that he even thought of me for this is more than I could express. Marshall: All of these things have done, have made such an impact on culture in the city that it’s almost impossible to ignore that, and it makes perfect sense to honor that. Kelly: I believe this will be an iconic part of our great public art assemblage in Chicago and everyone’s going to want to come to this. Emanuel: Before anybody else knew it was the Year of the Woman, Kerry James Marshall saw that, which is what makes a great artist, is they’re able to see around corners and have us see things that are actually present, but not visible. Marshall: It just seemed like a great place to bring the living culture of the Cultural Center, and the living culture of the city to life again. May 3, 2016: From his studio in Bronzeville, Kerry James Marshall creates large-scale canvases that are prized in museums around the world. A 1997 winner of a MacArthur "genius" grant, Marshall spoke with “Chicago Tonight” at the opening of his career retrospective at the Museum of Contemporary Art. Oct. 6, 2009: Twelve years ago he earned a “genius” grant for his creative vision. Since then, Kerry James Marshall has produced waves of art for an international audience, all from his cluttered studio in the historic Bronzeville neighborhood.